A thrilling final day is in prospect at Trent Bridge, where Yorkshire will be looking for their first win of the season in their Specsavers County Championship match against Nottinghamshire. The reigning champions, who had drawn their opening two fixtures, forged a first innings lead of 29, after being dismissed for 290. Batting for a second time, Notts reached stumps on 151 for five, an overall advantage of 122, with Samit Patel unbeaten on 51. Nottinghamshire lost two wickets before wiping out the deficit, with Steven Mullaney becoming David Willey’s first victim for Yorkshire, whilst Greg Smith misjudged one from Steven Patterson that jagged back and toppled over his off stump. The wily Patterson then snared Michael Lumb, nicking to Adam Lyth at second slip. Alex Hales made a dogged 34, battling his way through 115 deliveries, before being cleaned up by a Jack Brooks delivery that kept low. Liam Plunkett, who earlier in the day had made a splendid 51, then blasted one through Riki Wessels’ defences to leave Notts in trouble. Patel, who reached his 50 from 66 deliveries and hit nine fours, added 53 in an unbroken partnership with Chris Read, who closed on 13 not out. Earlier in the day, Yorkshire’s final six wickets produced an additional 120 runs, taking the defending county champions into their slender lead. Alex Lees only added a single to his overnight score, moving to 92 before nicking Harry Gurney behind to wicketkeeper Read. 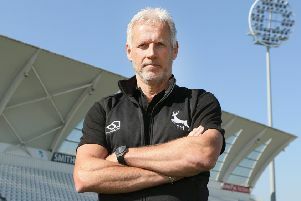 The catch was Read’s 900th in first class cricket for Notts and also made amends for him dropping Lees off the same bowler late on the second evening. Ball, who claimed three wickets at the start of the Yorkshire innings, entered the attack after around an hour of play and struck immediately to dismiss the visiting captain for 44. His third delivery found the outside edge of Andrew Gale’s bat and Mullaney pouched the offering at second slip. The other four wickets were shared between Patel and Jackson Bird. Patel’s first ball of the day, a high full toss, was slapped by Adil Rashid straight into the hands of deep midwicket and then he also removed Patterson to claim his 250th first class wicket. The tireless Bird earned some reward for his efforts by having Willey caught behind for 18, before having Plunkett taken in the deep, one delivery after reaching a 52-ball half century, which included one mighty six from the bowling of Stuart Broad. As the players left the field to go for lunch Jake Ball, who recorded figures of four for 57, was presented with his Nottinghamshire county cap.